The most important and cost effective preventative maintenance process you can have performed on your parking lot is hot rubberized crack sealing! Crack sealing your asphalt will help prevent water from penetrating into your sub-base, which is a major cause of pavement failure and leads to alligator cracking. By using state-of-the-art equipment to install DOT approved hot applied crack sealants (meeting or exceeding FAA, ASTM and DOT standards) we can install crack sealants that are designed to last. If they are left unattended, open cracks will begin to compromise the qualities of your pavement surface and eventually lead to the need for costly repairs or replacement. They may also increase your chance of liability problems by trip & falls. We offer an option to extend pavement life through the use of a crack repair maintenance program, which deters the harmful effects of water penetration into the sub-base. Application of a hot rubberized asphalt crack sealer will prevent water penetration into the sub-base thereby prolonging the life of your pavement and elimination of potential liabilities. 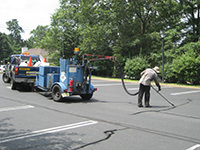 Hot rubberized crack sealing, if installed properly, is the foundation of a successful maintenance program for any type of pavement. Every 2 to 3 years, pavement should be inspected to see if additional crack sealing is required.